Since January, 2009 SASCO has resumed regular container service on Vladivostok - Vostochny - Korsakov line. 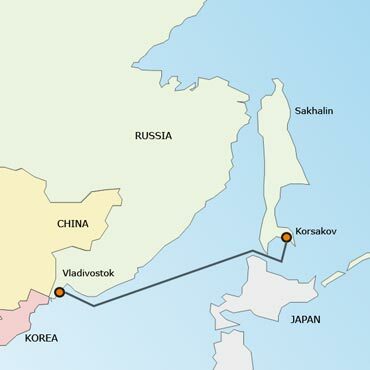 Every 5 days SASCO vessels enter the port to deliver consumer goods to Sakhalin island and to carry locally produced goods to other country regions. Duration of round voyage is 10 days. Vladivostok - Vostochny - Korsakov line connects the port of Vladivostok in the north-western coast of the Japanese Sea with the port of Korsakov in the eastern coast of Sakhalin Island. Korsakov is one of two major ports of Sakhalin and the biggest port of its western coast. Korsakov is a terminal point both for Sakhalin Railroad and for federal highway Yuzhno-Sakhalinsk - Korsakov. Vladivostok - Vostochny - Korsakov line performs mainly the carriages of containerized cargoes, including dangerous ones and perishables (goods which are to be carried in refrigeration containers), as well as various general cargoes. Vladivostok - Vostochny - Korsakov line operates vessels fully equipped for container carriages. If required, those vessels may be substituted by other SASCO vessels. Liner vessels perform either interport water transportation of cargos or multimodal transportation by railway and by sea (SASCO is a party of relevant agreement with Russian Railways). This line delivers both ordinary container cargoes, and cargoes requiring specific handling, such as hazardous cargoes, autos and heavy duty vehicles, oversized and off-gauge cargoes. One may also attend the cargo onboard the vessel. Carriage may be arranged in shippers’ containers as well as in SASCO owned containers (including reefer containers). Sakhalin Shipping Company is pleased to announce that since August 2011, we have been offering additional call of mv ZEYA on Vladivostok Sea Container Terminal of Fishing Port. Initially SASCO liner vessel ZEYA calls on Fishing port on rotational basis Bagram Terminal-Korsakov-Fishing Port-Bagram Terminal. So our customers will have broad options to ship containers' lots from Russian inland on the combined rail-ocean service to main destinations of Russian Far East, such as Vladivostok, Sakhalin, Magadan, Kamchatka, via Vladivostok Sea Container Terminal.